Travis Schleusner was born and raised on a dairy farm in Watertown, South Dakota. A big part of his interest in aviation started as a young boy through stories from his grandfather, who was in the Jolly Rogers 90th Bomb Group in WWII where he piloted many missions in the Pacific. Travis was fascinated by hearing stories from his grandfather about exciting aviation adventures and challenging experiences. As his interest in aviation grew, everyday encounters with aviation such as watching crop dusters spraying fields amidst the expansive farmlands of South Dakota were some of the most memorable and awe inspiring experiences of his formative years. From a young age, Travis knew his passion for aviation and career aspirations were aligned. Mr. Schleusner’s aviation career started in 2000 when he enrolled in the FAA Airframe and/or Powerplant (A&P) school at Lake Area Technical Institute (LATI) in South Dakota — the only Aircraft Maintenance Technician program in the state located right in his home town. 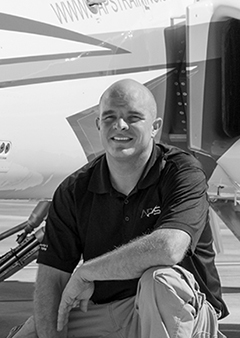 After graduating in 2002, Travis started his formal career out of state in the fast-paced commuter airline world with Great Lakes Airlines, where he joined a large team of A&P mechanics for three years maintaining 30 Pratt & Whitney (P&W) PT6A-67D Beechcraft 1900s. In 2005, his next career phase lead him to corporate aviation with DynCorp International as a Shift Leader and Inspection Supervisor. He maintained six P&W JT15D Citation Ultra 560s and five P&W PT6 King Air 200’s. Over the next several years, Mr. Schleusner was responsible for maintaining a diversity of other airplanes including Bombardier CRJs, Cessna 310s, Cessna 425s, and Shorts SD-360s. In 2012, he returned to his home state to be closer to family where he managed an FBO for five years. As General Manager he was responsible for all aspects of the business operation including hiring, aircraft maintenance technician training, scheduling, maintenance, and all airworthiness inspections. Under his leadership, the FBO maintained and serviced: Cessna C150s, C172s, C180s, C210s, C310s, and Turboprop C425s, TPE-331 Garrett-powered AG Thrushes, Citation Mustangs, CJ2s, and Embraer EMB-145 ERJs. Looking for a change, and growing tired of South Dakota winters, Travis set his sights on Arizona where he joined Aviation Performance Solutions (APS) as the Director of Maintenance in August 2017. Travis is a key member of the APS operational team. He is a dynamic aircraft maintenance technician with Inspection Authorization (IA), known for his troubleshooting expertise, problem solving capabilities, and friendly, effective communications skills. APS recognizes Travis as a natural leader, talented mechanic, and success-oriented director that is empowered by, and fully aligned to, the APS Vision.